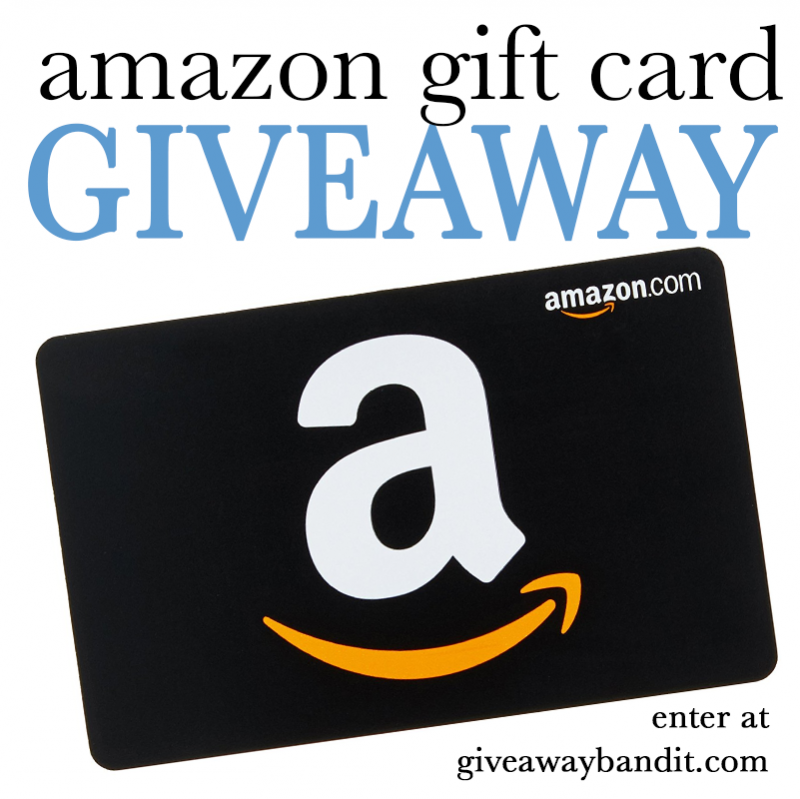 Welcome to this fun Amazon $25 Gift Card giveaway. With Amazon, the possibilities of purchases are endless so we thought now would be a great time to help one lucky winner with this giveaway. Be sure to check out our other great giveaways to win lots of prizes! Giveaway ends March 1, 2019 at 11:59pm EST. Giveaway is open worldwide, ages 18 and older. Disclaimer: No purchase is necessary to enter. One entrant per household, per address. Void where prohibited by law. Winner(s) will be contacted by email and have 24 hours to respond before a new winner is chosen. The sponsor(s) will be responsible for product shipment to winner(s) of this sweepstakes. This event is in no way administered, sponsored, or endorsed by, or associated with, Facebook and/or Twitter, Google, Pinterest. Contact melanie@giveawaybandit.com if you have any additional questions or comments. If winner is other than US they will receive $25 USD via PayPal. Thank you for this awesome giveaway opportunity! 🙂 Could you help me with something? How do I find the URL of my retweet of your tweet? I’ve noticed a couple of other giveaways I’ve entered on other sites ask for that too, but when I click on the “stamp” where I think it should take me to my URL…it just takes me back to your original URL?!? I’d appreciate any help you could give me with this. I’ve asked the people at Twitter and the other bloggers, but I’ve yet to get a reply from anyone! Thanks! Oh gotcha. You can also manually copy and paste the tweet..then add RT & @the twitter handle you are retweeting from. I honestly retweeted all three entries. I have NO IDEA how to find the URL of my retweet. I have asked before and got no answer as to how to do it. I have asked other bloggers as well, and they gave no answer either. Is it even possible. I tried EVERYTHING! If you can help me, I’s SO APPRECIATE it! THANKS so much and also thank you for the giveaway! I’ve tried everything too Kathleen and for the life of me I can’t figure it out! 🙁 And I can’t get an answer out of anyone either. UGH! When I look at my tweets on my page, I see the tweet and the time stamp of when I retweeted it, but when I click on that stamp, it just takes me back to the original tweet! So I’m not even sure if there are URL’s to our retweets? But if not, I don’t know why the blogger would ask for the URL link to our retweet and at other times as for the original link to the tweet that we retweeted!? I’m confused. I went ahead and retweeted, but didn’t claim the entries because I don’t want to be disqualified or anything. I’ve sent a couple more message to Twitter. If I hear anything from them, of the other 3 bloggers I’ve asked, I’ll be sure and let you know! Maybe we’re supposed to just copy and paste the tweet and do it that way? This site is so helpful and has so many good giveaways. I have entered the Jennifer Falls Chicken Soup for the soul and spritzer giveaway. I like the Best Buy ideas that were given for Father’s Day from Best Buy. They have been very helpful. I did not know rebok made walking shoes will check them out for sure! The New Star Wars movie fan contest is a very interesting one. One of the first things I would buy is a pair of slippers for my husband. If I won I would buy a telescoping lens for my mom’s Canon camera. I would buy some books for my children! They both have lists on Amazon. I would buy a new e reader for me and for my husband. I would buy some household supplies with the gift card. Thanks for the giveaway! I really want a white noise machine. I would buy some books I’ve been wanting to read. I’d buy some cat toys. I would put it towards a new bicycle. I would put it towards getting a camera. I would put towards books. I would use the card towards an elliptical machine. This would be perfect for our new grandbaby.you can never get enough diapers.thanks so very much for sharing. They have EVERYTHING! I would put it toward the Beginner’s sewing machine I desperately want….so I can teach myself to sew! I would buy myself some books and beauty products! I would buy a dslr camera. I have been wanting one of those for a long time. To finish the kids birthday shopping! I would buy car parts. Exciting ? Absolutely not but I need them to get our second family car up and running. I’d love to get “Into the Woods” on blu-ray from Amazon with the winnings! I would buy the book Under the Dome by Stephen King and also The Eagles Greatest Hits!! I commented on Pineapple upside down cupcakes. look so good! I am not fond of comments simply because I have severe social anxiety disorder. I don’t comment on many posts. If you want me to pick out an item from a sponsor, that’s fine. But asking me why I like the item…it is hard for me to voice my opinion and I avoid it. I don’t mind commenting but I do worry about whether or not the blog owner can see my e-mail address. I also really hate when they practically shout at you to not copy your neighbor, sometimes my thoughts are similar to a previous commentor and I worry it will be seen as “copying”. I prefer not having to comment since its much faster not to, but I do comment when the prize is worth it. I really don’t mind either entry method. Never knew that entry forms were paid for. I don’t mind writing comments. Thanks so much. I like this method better. I stopped entering blog because of the thousands or hundreds of thousands entries. This also is better for you with the form I just clicked and go and most of the time i have no idea what I clicked. At least with this there is a little thought behind it. I find forms easier and value the privacy, but I understand if the payments became onerous. I prefer forms, not comments. I joined the FB Group quite awhile ago, but I would prefer not to leave my name in a public comment. I hope that my word will suffice for now and that you don’t mind emailing me privately for my FB name. Thank you. I prefer forms. Easier to fill. Consistency in what I fill. No one reads or has my information. Thinking up what to say. Either way is fine with me. I just assumed entry forms like rafflecopter were easier for the one doing the giveaway. I would rather money be spent on prizes than entry forms. In other words, no I don’t mind using comments . I prefer the forms! They are easier and faster! Am already a member of your FB group! I prefer using comments instead of the long rafflecopter forms. I don’t mind using comments at all for entering giveaways. It’s all enjoyable for me no matter what! Forms are really easier, especially the giveaway tools one, but I understand your reluctance to pay for them. I don’t mind using comments! I’m a member of your Facebook Group! I don’t like doing comments. I usually avoid them. A form would be better. I like the entry forms. Of course, forms are easier. I had no idea you had to pay! Comments take longer, and you have to think-ugh! I joined your Facebook group as Debbi Otto Wellenstein. I retweeted, Twitter handle is @foodhistorian. I have sent a request to join your Face Book group, approval is pending. I don’t mind using comments to enter at all. I never knew the giveaway widgets charged a fee. I prefer entry forms personally but have no issues with commenting for entries either. I joined your facebook group. I prefer entry forms… a lot quicker! I don’t mind commenting for a giveaway entry. What about gleam? It has a free option. Rafflecopter is not the option. I prefer entry forms but could def use manual. Thank you for the chance! I don’t mind leaving comments. I remember the days where giveaways were only comment based. I personally prefer only using entry form, or survey! I do not mind comments, I would feel blessed to win a giveaway, any way I enter. I personally like an entry form, however, I don’t mind entering by commenting. I am fine with ANY form of entry. I like entry forms better but do not mind the comment ones. I did not know that they cost money. Good to know. I really prefer the entry forms because sometimes I really don’t like to come up with things to say about products. I’m new to this so I wouldn’t mind writing a comment OR completing a form. Comments are nice to read, though! I perfer just leaving a comment. I also love to read the other comments left. I prefer the form I don’t care for all the comments one has to make. Go here to comment on this. I prefer it more simple. I’m fine with either one. I’m just thankful for the chance to win. thank you! I do prefer entry forms, but you make an excellent point. I think perhaps fewer people enter comments, so the odds are probably better too for those who do enter. While I prefer entry forms because it’s so easy to enter I’m ok with comment forms as long as there aren’t a lot of mandatory things we need to do to enter. I don’t mind at all! Thanks! I prefer entry forms because it is easier to keep track of what contests I have already entered. It is your giveaway, your rules, do what works best for you. Personally I love forms & enter less when its comments. Thank you for all you do & the offers for your fans. I do prefer forms… u know you can make your own forms. Just a little coding.. I don’t mind leaving comments. Either way is fine for me, though I do prefer Giveaway Tools for it’s simplicity. I don’t mind making comments. I didn’t realize you had to pay for forms, so this works for me! i don’t mind comments or entry forms. i like them both. I do not mind doing comments at all over entry forms! I actually prefer comments over entry forms. I requested to join Facebook group. I don’t really mind comments but I guess I prefer entry forms. Either way I guess. Not a lot of help am I? Either way is fine with me. I prefer entry forms but many have so many tasks to do for entry it gets frustrating. I don’t mind leaving a comment as a entry. I think anything that saves money anywhere is a huge plus. Every little bit ads up. I sent a request to join the facebook group. It’s pending. I don’t mind commented . I will enter a your giveaways either way. I don’t mind commenting as long as I can enter my own name and email address in the comments. I’m not sure if the Google entries will go to an inbox that I will see. I don’t mind commenting for entry. A lot of the entry forms require a comment for mandatory entry first anyway. I don’t mind comment entries. I don’t mind leaving comments for an entry. Thank you for hosting! I retweeted the Tweet you posted (Mail4Rosey). I requested to join your facebook group (Rosey Marie). i dont mind at all using comments! I prefer forms because of privacy issues. I don’t mind comments because the odds are better. I do prefer form entries compared to comment entries. I do not mind a short comment requirement for entry; have seen some bloggers use very simple, self generated entry form that only require name & email for giveaway entries. I like the forms but didn’t know you had to pay for them. I can enter this way, no problem. A bit clunky but doable. It’s a bit of a pain to do it this way, but worth it for $100 Amazon.